Nine years ago today President Bush visited Ground Zero in New York City. 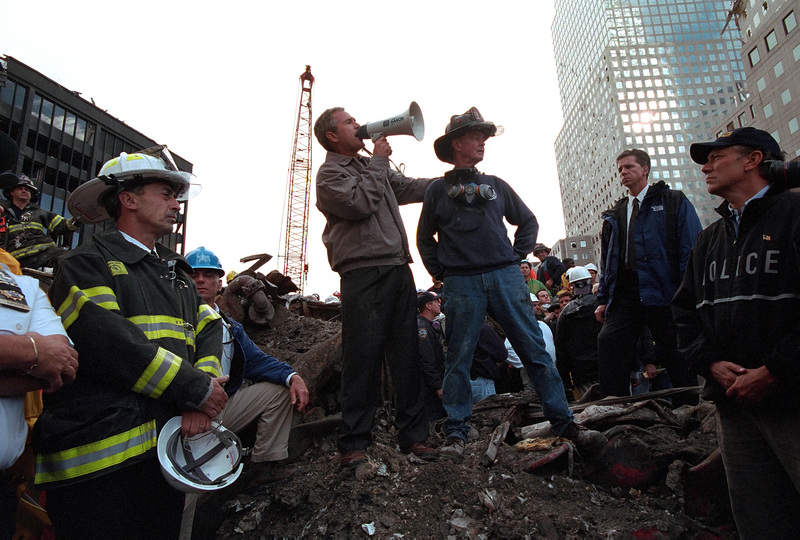 One lasting image is of the President, standing on a pile of rubble with his hand on the shoulder of a firefighter named Bob Beckwith, talking to the rescue workers with a bullhorn. Over the weekend I realized I know most of the people who were with the President at that moment. Eric Draper was the President’s chief White House photographer for all eight years. He led an incredible team of photographers who captured key moments in the Presidency. Eric is a phenomenal photographer, a good man, and I am proud to have worked with him. I’d like to share Eric’s photo and comments from Eric and others who were on the scene when it was taken. You can click on the photo for a higher resolution version. (white helmet on head and in hands) Assistant NYFD Chief ? I describe Administration officials below with the job titles they had at the time. I remember standing at the site which still smoldered from the terrorist attack three days earlier. President Bush had just finished touring Ground Zero and embracing and talking with hundreds of firefighters. As the White House Photographer, I focused on capturing the strong emotion there. I had to press my way through the crowd to stay with the President, who was being guided to a spot to speak. I was close enough to the President to touch his legs if I tried, so I had to use my widest camera lens. When he said, “I can hear you,” I knew it was going to be a powerful, historic moment. I watched my President lead the country through its shock and grief. Eric reports that the photo was taken with a Nikon N90 camera, 17-35 zoom lens on Fujichrome 400 film. Shutter speed 500/2.8. Most don’t realize it but he is actually standing on a crushed fire engine – the highest part of what was a huge fire pumper, reduced to about four or five feet high. The firefighter standing with him was actually a retired member of the department who grabbed his old helmet and headed to Ground Zero when he saw what had happened on TV. I got home and I told my wife, ‘I’m going down,’ ” he said, referring to the smoldering remains of the Twin Towers. At first, his family dissuaded him from going to Ground Zero, but after Beckwith discovered that one of his colleague’s sons was one of the hundreds of firefighters missing, he put on his old uniform, strapped on his helmet and went to join the rescue efforts. Beckwith had to finagle his way into Ground Zero when he approached the heavily guarded perimeter. “I said, ‘Come on, guys. You know I got to get in there.’ I showed them my identification card from the fire department and so a couple of guys let me through,” Beckwith said. Once inside the perimeter, Beckwith got a firsthand look at the charred remains of the World Trade Center and immediately began working to find survivors. After helping the president onto the truck, Beckwith begins to crawl down, but Bush stops him. “Do you remember the TIME magazine where the president is holding up the flag? He wanted me to have that flag. I still have it,” Beckwith told CNN. Driving to the event there was a real emotional tension, we all knew we were going to a place of epic tragedy in our Nation’s history but the reason for our visit was to provide strength and support to those who were there, and the Americans who would be watching on television. Not a lot of conversation, and because the event had little planning there was little to discuss on the way. We knew there would be unscripted moments that would be seen around the world. The wreckage on the site was terrible, there were several places where smoke was still rising from the ruins of the towers. Beams, wires, concrete and other skeletal remains were visible among the ash. Although many families and friends were still hopeful of finding loved ones, it was apparent upon seeing what was left of the towers that it would take no less than God’s hand to pull a survivor from what was left there. It was a heartbreaking sight. None of us at the White House had slept much since the attack, but we had showered and grabbed a meal or two and some rest. It seemed like no one at Ground Zero had stopped working since they were allowed into the site, and by talking to the people in charge we learned that was generally true. People were literally working to total exhaustion, multiple days without any real rest or food, and were still pushing themselves. No one wanted to give up. We talked to numerous emergency responders as the President walked the site. Most looked exhausted, had ash on their clothes and faces, and were emotionally drained. As the President talked to them, expressing gratitude, consoling some, and encouraging all, you could feel the strength and energy rising. He stepped up on the ruins of the fire engine, was handed the bullhorn, and began to speak. From the other side of Ground Zero, where a large number of the emergency responders had gathered, someone yelled “We can’t hear you!” The President’s response was from his heart, totally unscripted, and everyone felt he power of his words. The site literally erupted with cheers, it was incredible and energized and lifted those working at Ground Zero and those of us traveling with the President. In the end, all of us, I think the President included, left with a renewed energy and strength. Those men and women inspired all of us to work hard and do all that we could to support the President as he worked to protect our Nation. What we came to provide to them, they actually gave to us. I was shepherding the pool that day, having arrived with a small team from DC the night before, and was standing next to Draper when he took the photo. Nina Bishop — another advance person — was the one who is responsible for the bullhorn. As the President was shaking hands with first responders it became increasingly clear that he had to say something. Thinking fast, Nina found a bullhorn and when the President stood atop the rubble she simply handed it up to him and he did the rest. Completely unplanned. Totally authentic moment. But the untold story is how the video came to be. When people recall the television imagery of the President making those remarks atop the rubble, what they don’t know is how that happened. Twice. The press pool consisted of some print reporters, some still photographers, and one television crew (correspondent, producer and cameraman). Since we were in the middle of Ground Zero, the television camera wasn’t connected to an uplink truck, therefore it was not live. What we didn’t know was that another network some blocks away had a camera on top of a building pointed at Ground Zero. From their vantage point, and as far as they could zoom in, all they could make out was a small cluster of people at Ground Zero (that was us). The producer in our press pool was on his cell phone giving live color commentary to all the networks who were in the pool. The networks also had access to the live shot from the other network from the building some blocks away. When the producer said that the President was about to make some remarks, he held up his phone to get the President’s voice. The networks put the voice of the President broadcast from a cell phone over the live video from the other network, and voila! The closeup video that we recall of the President’s remarks atop the rubble was actually broadcast later in the day when the pool cameraman was able to feed his closeup video. I watched this from a short distance off. Behind me a few yards to the east were about twenty religious leaders, led by Cardinal Edward Egan. They too had joined in the chanting, many waving small American flags. Most were weeping. I could not glance at them for more than an instant: I felt I too would succumb if I looked too closely or too long at them. … I asked her if there was a microphone available. She shook her head no. Could she get a bullhorn? She scurried of to grab one from some of the workers milling around. I looked for a place the president could speak from. The SUVs in the motorcade had wide running boards, but if he stood one one, he would still not be seen by all the people who had clambered up on piles of rubble and vehicles all around us. Right next to me was a giant wrecked fire truck. The pumper had been smashed by falling debris. Its crumpled door read 76 ENGINE COMPANY. Its tires had blown out, and its body was crushed, but three men were standing on top o fit and the entire crowd could see the president if he joined them. I looked up at the workers, and as I did one jumped off the truck. I got the attention of the remaining two and asked them if it was safe. The younger of the two replied it was, while the older man, wearing a fireman’s hat from New York Fire Department Company 154, nodded in agreement. I was unconvinced, so I asked them to jump up and down. They looked quizzically at the strange guy in a suit and tie, and I repeated my request. They hesitatedly jumped up and down; the truck looked steady enough for Bush to clamber up. I told the two men, “Stay there — someone might need your help to get up.” Before going to look for Andy, I reached for a piece of paving block that had jiggled when the rescue workers jumped up and down. A policeman grabbed my wrist and stopped me, saying there might be a body part underneath. I felt sick. I found Andy Card and shared Nina’s suggestion; he immediate agreed that it was a good idea and asked where the president could speak. I pointed at the battered fire truck. Andy made a beeline to the president. Nina had commandeered a bullhorn from a man who worked for Con Ed and met me at the fire truck with it. The bullhorn’s batteries weren’t that good, but it was all we had. Nina gave it to Logan Walters. As she turned away, I grabbed a small American flag sticking out of Nina’s courier bag and handed it up to the thin, older rescue worker who was now the last man standing on the truck. His companion had disappeared off the back of the pumper and out of history. The cheers and chanting subsided and the president started to speak into the bullhorn. With the National Cathedral prayer service still fresh on his mind, Bush began by saying, “I want you all to know that America today is on bended knee in prayer for the people whose lives were lost here, for the workers who work here, for the families who mourn. This nation stands with the good people of New York City and New Jersey and Connecticut as we mourn the loss of thousands of our citizens.” Someone yelled, “Go get ’em, George!” Someone else yelled, “George, we can’t hear you!” and others echoed this complaint. Bush paused and then responded in a voice now fully magnified by the bullhorn, “I can hear you.” The crowd went nuts–and he knew what to do from there. “The rest of the world hears you,” he went on, “and the people who knocked these buildings down will hear all of us soon.” The crowd broke into defiant, even bitter, chants of “U.S.A.! U.S.A.!” Bush handed the bullhorn off and he climbed down. In an iconic moment, George W. Bush was very much alone with an enormous responsibility. The nation wanted reassurance; it wanted to know it had a leader who understood the mission America now faced. No speechwriters, no aides, no advisors were involved in Bush’s response. It was an authentic moment that connected with the public in a strong, deep way. Without assistance and in an instant, George W. Bush gave voice to America’s desires. I’d love to add to this post the recollections of any first responders on the scene when the President spoke, or any of those in the press pool mentioned by Greg. Thanks once again to President George W. Bush for his leadership during this time of national tragedy and crisis. And thank you to all those who worked so tirelessly at Ground Zero nine years ago.